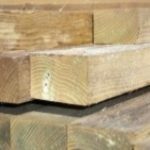 All the fence posts featured on this page are available from stock with delivery in 2-5 working days. Tanalised timber post 75mm x 75mm (3in × 3in) fence posts. Available in a 1.5m(5ft), 1.8m(6ft), 2.1m(7ft), 2.4m(8ft), 2.7m(9ft) and 3m(10ft) lengths. Allow 2ft in ground and add fence height for total post length. 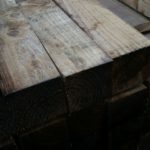 Tanalised timber post 75mm x 75mm (3in×3in) fence posts. Available in a 1.8m(6ft) and 2.4m(8ft) length. Allow 2ft in ground and add fence height for total post length. 100mm × 75mm (4in x 3in) tanalised brown gate/fence post. Available as a 1.8m(6ft) and 2.4m(8ft) length. 100mm x 100mm (4in x 4in) post. Suitable for hanging most single entry gates. Allow 600mm (2ft) to be concreted into the ground. Flat top tanalised fence/gate post. 100mm x 100mm (4in x 4in) post. Suitable for hanging most single entry gates. Allow 600mm (2ft) to be concreted into the ground. Available as 1.8m(6ft), 2.4m(8ft) and 3m(10ft). Flat top tanalised fence/gate post. 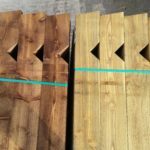 2.4m(8ft) long notched fence post available in green or brown – 125mm x 75mm (5in x 3in). Rounded top and ribbed post, available in a 2.4m(8ft) and 2.7m(9ft) lengths. Tanalised 100mm(4in) x 100mm(4in) posts, 1.2m(4ft) long with a V notch in the top to take either a 75mm(3in) square rail, using flat straps or a 100mm(4in) square top rail, using the Bishops hat straps. Available in Tanalised Green and Tanalised Brown. Suitable for closeboard or featheredge fences. 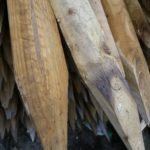 Quality pressure treated softwood tree stakes are ideal for plants which need solid support during their growth and can also be used with fencing hurdles to hold them in place. Tanalised pressure treated, natural, pointed stakes in circa 2-3 inch diameter. Available in a 6ft and 8ft length. 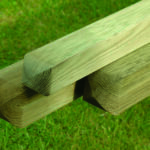 Oakdale Fencing supply an extensive range of fence posts. 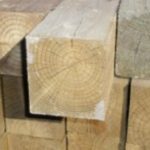 We stock both wooden and concrete fence posts designed to work with the various fence panels we stock. Available in a wide range of sizes and dimensions, you will find everything you need to complete any fencing project. 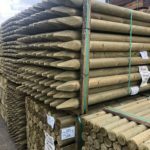 Our range of fence posts includes everything from small fence posts ideal for low level garden fencing or boundary dividers, right up to heavy duty fence posts perfect for industrial fencing. 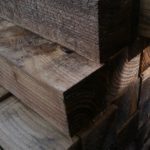 Our fence posts are manufactured to the highest quality, we tanalise our wooden fence posts to ensure that they have a longer life expectancy and are more resilient to harsh weather and rot. 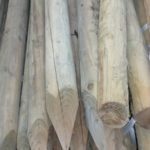 Within our range you will find fence post stakes both natural and machine rounded ideal for farming and agricultural use. 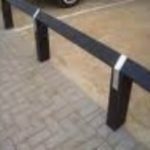 These post are available in various sizes to suit your ideal fence height. 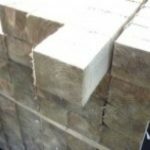 For those looking for heavy duty fence posts, we also stock both tantalised timber and concrete posts. On this page you will also find posts suitable for both fencing and garden gates.